7 Where is it used? Have you ever refreshed yourself drinking water from a bottle claiming to have been purified through reverse osmosis, and had not idea what that meant? Read along, and next time you will be certain of what you are drinking. Let´s begin our understanding of the process by explaining first what osmosis is. Osmosis is a process where a low saline solution migrates to become a strong saline liquid. A natural tendency will always make a low concentration solution migrate into a denser one if put together, and not the other way around. 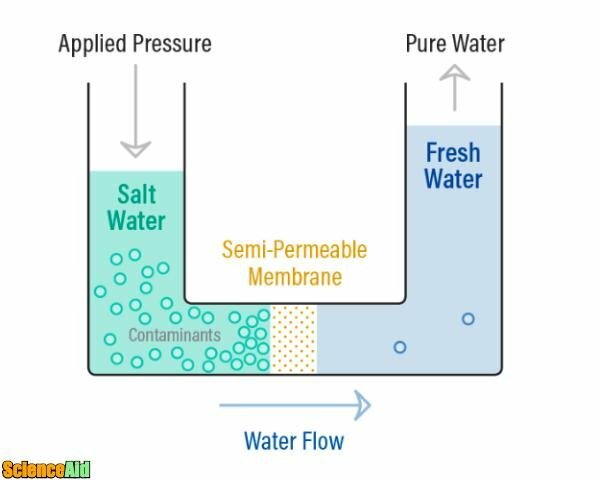 To start an osmosis process, you need a semi-permeable membrane; this is a membrane that allows some molecules and atoms to go through, but prevent other ones to pass. It works like a kitchen strainer that would allow your brewed coffee to pass, but not the coffee grounds. 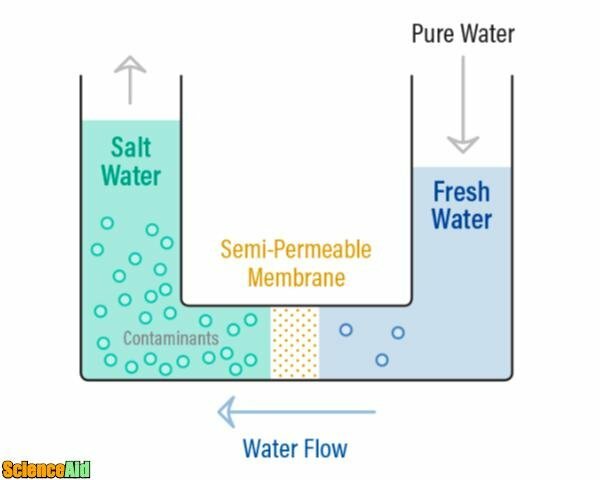 So if you have water with a few salt on it and in another container, you have water with way more salt, then place a semi-permeable membrane between them, low-salt water will begin to migrate naturally to the higher salt concentration side. Just as its name states, it is the osmosis process but in reverse. Osmosis occurs without any external energy needed; on the contrary, the process of reverse osmosis requires energy applied to the solution with a higher dose of salt. The energy has to push the saline water with enough power to force it through the membrane, applying a higher pressure than the one that would occur naturally. The semi-membrane used in reverse osmosis process allows the passage of water but prevents a wide variety of salts, bacteria, and pyrogens from passing. This process would desalinate water, demineralize and deionize it; by allowing only pure water through the membrane, and by preventing most contaminants from passing. The process requires a constant stream of saline water, a high-pressure pump, and a semi-permeable membrane. The saline water stream is pushed by the energy of the pressured pump with enough power to force it through the semi-permeable membrane. The amount of pressure the process will require depends on how much salt is contained in the feed water. The more salt there is, the stronger the energy necessary for the pump to push the water. The membrane will allow the passage of water molecules, but not salt or other contaminants. Once the water passes through the membrane, 95% to 99% of salts get left behind. This clean water is called "permeate," and is now free from minerals and ions. The remaining water that did not go through the membrane is called "reject." Instead of a usual filtration process where a filter collects contaminants, reverse osmosis uses a cross filtration system; this means that the solution either passes through the filter or across. Then the filtered water goes on one side, and the rejected water runs on the other. This method allows the filter (or membrane) to be swept from the build up contaminants, due to the constant and turbulent water flow and also to avoid clogs. The most efficient reverse osmosis water treatment plants have a system where the rejected water from the first process goes to a second and even third crossed filtration to get as much purified water as possible. In this scenario, 80% of saline water is cleaned. The remaining 20% ends as a concentrated solution that has to go to a different water treatment plant and then be released into the ocean after being treated for impurities. 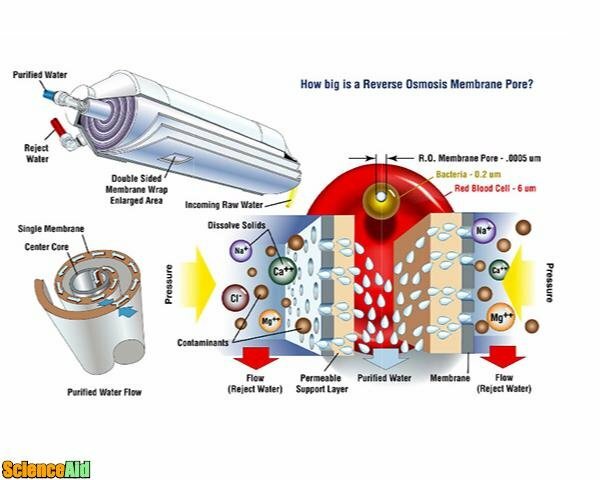 The membrane on a reverse osmosis process rejects impurities based on their size and ions charge. Contaminants with a molecular weight above 200 will be discarded. Water, for example, has a molecular weight of 18 so it would easily pass through the membrane. 99% of dissolved salts or ions, can be removed through reverse osmosis, also bacteria, colloids, pyrogens, and organics. However, sodium and calcium are not rejected, likewise gasses such as CO2 because none of them have a high charge of ions. 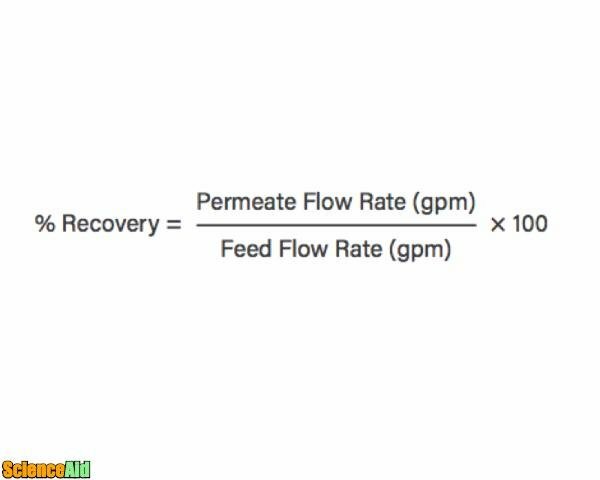 Since reverse osmosis can not reject gasses, it is likely that the permeate water can contain a lower PH level than normal, depending on how much CO2 was in the feed water in the first place. CO2 will pass on the permeate water as carbonic acid. Some natural water sources have massive amounts of fluoridation, if the water is drunk it may cause enamel fluorosis which are mottled teeth, or even a worse disease called skeletal fluorosis which can cause a person´s bones to bend. Reverse Osmosis is one of the few processes that can take filter fluoride on a large scale. The higher the salt rejection means, the system is working efficiently. 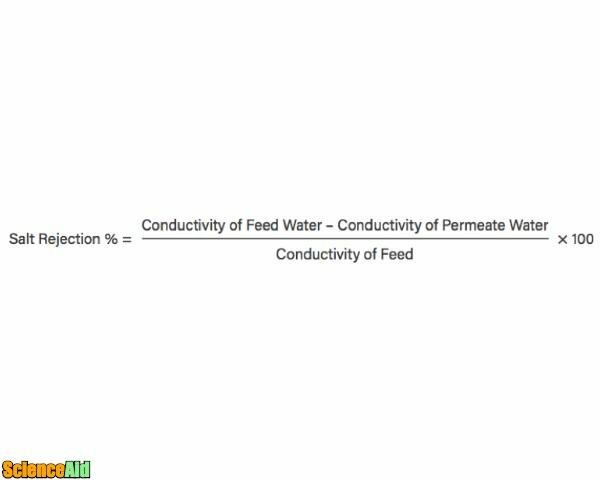 It should reject around 95% to 99% from the feed water. 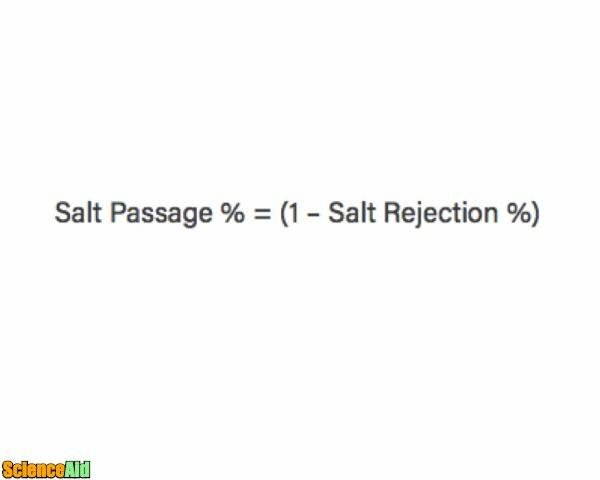 It is precisely the opposite formula to salt rejection. In this case, the lower the result, the better your system performance. This formula lets us know the percentage of water that went through the membrane and became good permeate water. However, the purpose is not always to achieve a hundred percent recovery rate, rather the proper % for a reverse osmosis to operate depends on what it was designed for. Calculating the % Recovery is a fast indicator to know if the system is working outside of what its original purpose. 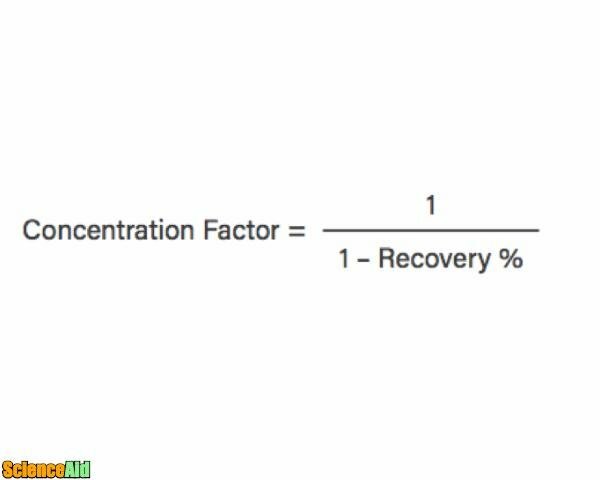 It has a direct relation to the recovery%. The higher the amount of water permeated, the greater concentration of salts and contaminants you will get on the other side. Pretreatment of the feed water using mechanical and chemical procedures. Scheduled maintenance of the membrane with high and low PH cleaners. The most useful way to use Reverse Osmosis so far is to desalinate ocean water. We can see the world is on the edge of a water crisis due to pollution, climate change, unprecedented environment impacts; yet overpopulation is on the rise. Having enough clean water will become a crucial matter. Somo countries are getting ahead on adapting their water treatment plants for reverse osmosis. This process is also used in the metal recycling industry; the metals are treated with chemicals that create toxic wastewater, and reverse osmosis can clean it out before it is discarded. 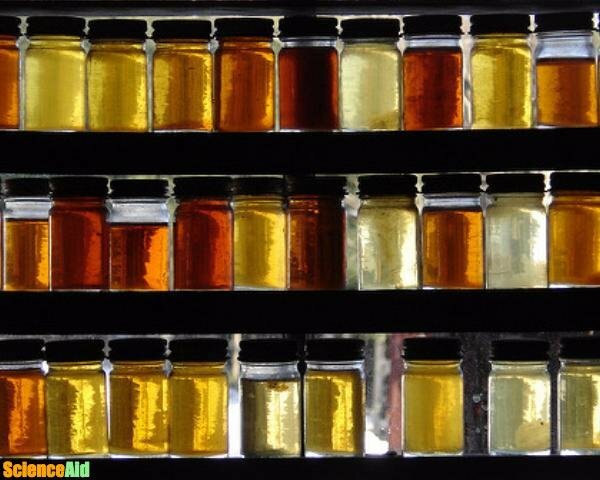 Maple syrup has been produced by reverse osmosis for a few years now, it separates the sugar concentrate from the sap. Dairy industry filtrates through reverse osmosis to make whey and milk concentrated. Some wine producers are using reverse osmosis to remove elements such as smoke or acids that are not desired for the final product, and also to control the content of alcohol. Pure ethanol, completely free from contaminants can be obtained through reverse osmosis. Some other industries that use reverse osmosis water are semiconductor manufacturing, food and beverage, pharmaceutical, boiler feed water, and metal finishing. In Perth, Australia, around 17% of drinking water comes from a reverse osmosis process. There are currently over 13,000 desalination plants around the world. There is a process called "toilet tap" which takes wastewater into a reverse osmosis process to make it drinkable. Although it might give you nausea, it is a promising project to have access to drinkable water in developing nations. There are residential "under the counter" reserve osmosis systems so you can have your own filtered water from the tap. Or an easier to install a counter top filter. MLA (Modern Language Association) "Reverse Osmosis Water Purification." 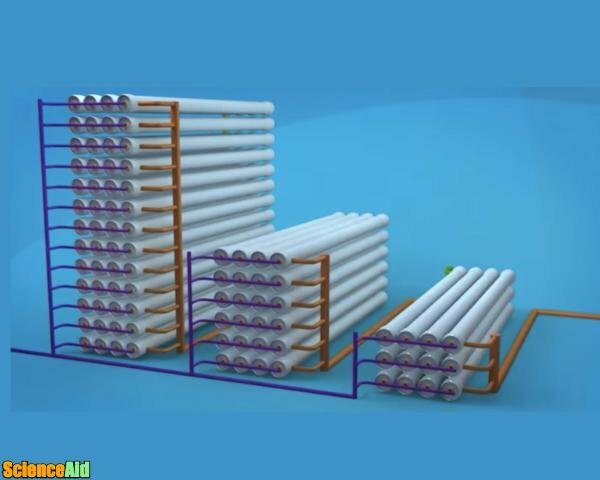 ScienceAid, scienceaid.net/Reverse_Osmosis_Water_Purification Accessed 25 Apr 2019. Chicago / Turabian ScienceAid.net. "Reverse Osmosis Water Purification." 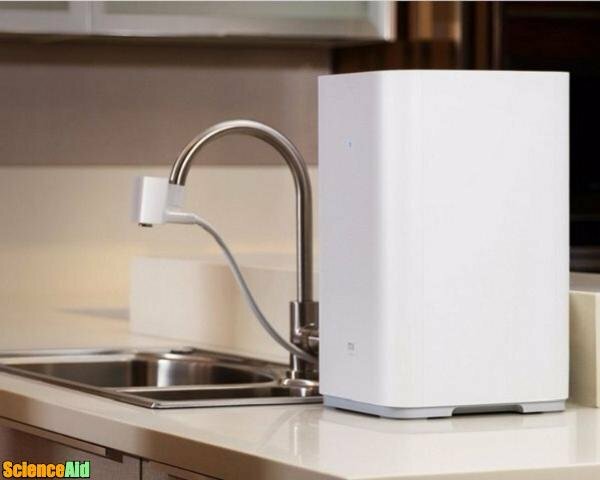 Accessed Apr 25, 2019. https://scienceaid.net/Reverse_Osmosis_Water_Purification.